From the very beginning, Domino Directory, originally known as the Name and Address Book (NAB), has been a key part of the Domino architecture. It has evolved from being specific to Lotus Notes and Domino to serving as a general purpose directory. 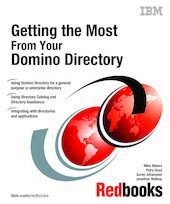 This IBM Redbooks publication explains Domino Directory services, how to plan for and implement them, and how they can be extended to work with other directory services. We start by discussing the purpose of this book and the IBM-Lotus strategy of directories. Then we explore the wide range of services that Domino Directory offers. We also discuss access to Domino Directory from an application development angle through protocols and technologies such as Notes API, LDAP, and JNDI. In addition, we look at technical approaches to directory integration and also a few real world examples where Domino Directory integrates with other directories. Finally, we cover some good practices in designing a directory infrastructure.